This stylish and comfortable footrest will help keep your feet feeling terrific all day long. 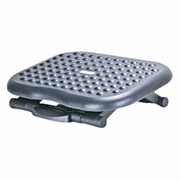 With its easy height adjustable platform, Using a footrest can help reduce lower back and leg strain. Using a footrest can help prevent a loss of circulation in the legs, as well as reduce the risk of varicose veins and blood clots. By not placing your feet on the ground or a footrest, you add additional strain on your lower back and hindering blood circulation. This is a great ergonomic solution for tired feet and legs. They're terrific for home, office, schools, banks, and anywhere you are required to be in a sitting position for long periods of time. Five adjustable heights for personal comfort. Platform size: 17.72" x 13" Height Adjusts Range: 5.43" ~6.73"